W.J. Keeler's map of the Union Pacific Railroad and it's Eastern Connections, 1867. This map isn't part of any series, but we have other railroad maps that you might want to check out. Keeler's map of the Union Pacific Railroad and its eastern connections in 1867. I'm afraid that I'm not all that knowledgeable, past the very basics, of our country's rail history. The best we can hope for is that some benevolent Railfans find my pages and leave some helpful comments. I'd be curious to learn more. Tags: 1860s, railroad, Union Pacific R.R. 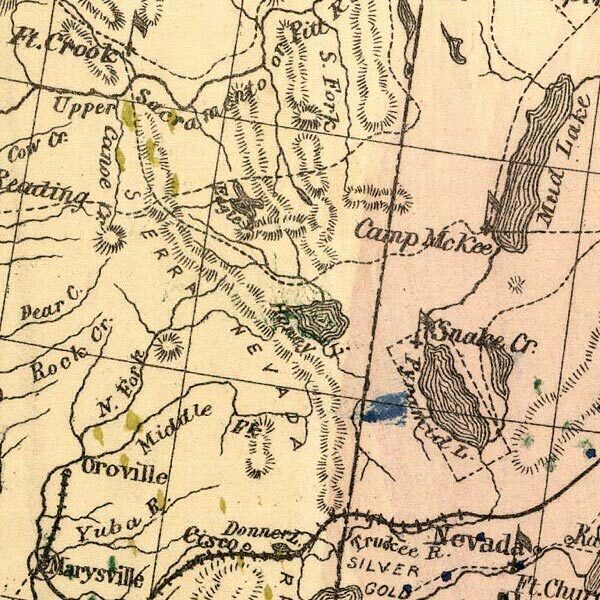 Union Pacific was the company that built the eastern portion of the “Transcontinental” route; on the map you can see the legend of the Central Pacific in NE Nevada. UP built westward from Omaha, Nebraska, via the Platte River and southern Wyoming. CP (which later changed its name to Southern Pacific) built eastward from Sacramento, California, via Donner Pass and Nevada. They met in the middle, on the northern shores of the Great Salt Lake. This map’s date is very shortly after the connection was made; notice the relative lack of other rail lines in the West. Only a few spurs around Sacramento and an unconnected San Francisco-San Jose line. The CP (later known as Southern Pacific) later developed most of the rail routes within California, including connection to Los Angeles, which is when they changed their name. They later built and purchased their way across the Southwest to create connections to the AT&SF network and eventually, a direct route between New Orleans and California was available via Arizona and Texas.